Kartoffel schälen und in Salzwasser kochen - noch heiß durch die Kartoffelpresse drücken. Bärlauch grob hacken. Butter erwärmen und mit allen übrigen Zutaten zu einem Teig verkneten. Mit Salz und Pfeffer würzen. 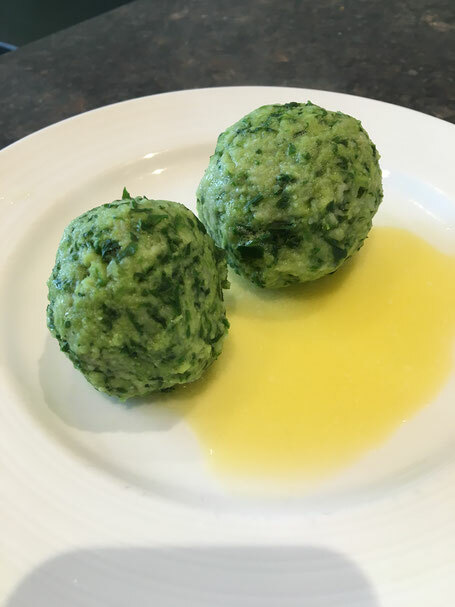 Knödel formen und in Salzwasser ca. 15 min. ziehen lassen. Its such as you read my mind! You appear to understand a lot about this, like you wrote the book in it or something. I feel that you just can do with a few % to power the message house a little bit, however other than that, this is wonderful blog. A great read. I will definitely be back. We're a gaggle of volunteers and opening a brand new scheme in our community. Your site offered us with helpful information to work on. You have performed an impressive activity and our entire group will probably be grateful to you. excellent points altogether, you just gained a emblem new reader. What would you recommend about your post that you made some days in the past? Any positive? Aw, this was an extremely good post. Finding the time and actual effort to make a really good article� but what can I say� I put things off a lot and don't manage to get anything done. It's actually a great and useful piece of info. I am glad that you shared this helpful info with us. Please keep us up to date like this. Thanks for sharing. I constantly emailed this web site post page to all my contacts, as if like to read it next my contacts will too.